Make a few extra bucks, who can't use a few extra bucks, every little bit helps! This program is ideal for anyone who is into health and nutrition, people who work out at gyms, or if you are a Trainer, Nutritionist, Physical Therapist, Massage Therapist, Doctor, Chiropractor or any other health type professional. This program works amazingly easy. We have designed a program in which you will no longer have to send your family, friends, or clients to other places to buy their supplements. As you know it is confusing to shop in supplement stores, and folks usually buy what the person behind the counter tells them to buy anyway. At least you can help them with their choices and make sure what they are taking actually works and is right for them and not dangerous, while being made by a company they can trust. All you have to do is simply send your clients to our website, they simply choose your name and you get credit for them from then on, or they can call us and mention your name and lastly you can simply order for them online too. We will then upload your credit directly onto your account at the end of each week like clock work. Products can be ordered by phone, by email or through our easy, secure online shopping cart. PLUS 10% Discount on all LifeSource branded products YOU order. * Cannot be combined with coupons, but we will honor the higher discount. Also not available on any 3 Packs or multi discount products. Here is how it works: All you have to do is sign up, and all we need to know is your info for the business cards, where to send your cards and catalogs/brochures and info and your commission will be uploaded onto your account every week. That is it! There is no inventory to carry or maintain. It is that easy. We have clients all over the world making great residual income just by helping family, friends, co-workers and people from the gym setting up the system to help them with their nutritional needs. LifeSource Vitamins is over 25 years old - We do not source any ingredients from China! We donate All of our proceeds to Campus Crusade for Christ (CRU), The Jesus Film Project, World Vision, local food relief missions, Students in Seminary school that need assistance and numerous other fine organizations worldwide. Bruce Brightman, our founder, is the youngest of 7 kids with 18 nephews and nieces, all of which take LifeSource products in 1 form or another. Including his own 88 year old Mother Katie, so you can believe we will make them safe and potent for our families and yours. One major factor for starting this company was losing his father Al Brightman to Pancreatic Cancer, he was 68. "My Dad loved vitamins and back then his own Doctor was telling him not to waste his money, now that same Doctor is telling all of his patients to take vitamins". This company was created to give back to God and His workings. 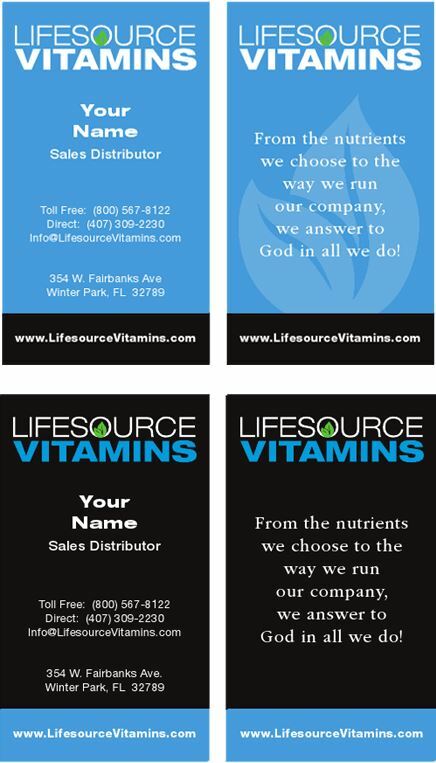 LifeSource Vitamins follows and goes well beyond all agency guidelines. GMP is the format or standard, which means Good Manufacturing Processes/Practices. We use Cold Processing with all of our supplements, as heat destroys nutrients. It is lots more expensive, but it keeps the nutrients alive which means they will absorb to the body and not just flow through. Over 95% of all vitamin companies use heat, why, it is much cheaper. LifeSource Vitamins has a Certificate of Authenticity on each batch of vitamins/supplements, which guarantees potency and freshness. LifeSource Vitamins has numerous plants that our products are manufactured in. 1 in Orlando, 2 more in the New England area, the rest are in Chicago. Our corporate office is located in Beaverton, Oregon. We also have a location in Winter Park Florida.